These days, it’s easy to pick up the phone and order a pizza that gets delivered to your door. You can even get really good pizza delivered to your door. But I’m still a sucker for the homemade version. On chilly winter nights, I love a sheet pan pizza piled high with toppings, like this meat lovers’ version. The sheet pan is a low maintenance way to make great pizza. The crust gets crispy and you don’t have to bother with special pizza stones. It also makes a BIG pizza, so you’ll probably have leftovers. If you are making pizza dough yourself, there are many options out there for dough recipes. Personally, I like the no-knead pizza dough approach. This makes a dough that’s easy to work with and very flexible. You can turn it into crispy thin crust pizzas, or you can use it in pan pizzas like this one, which that tend to have a thicker crust (though they’re not like deep dish, exactly). However! I’m a firm believer that the perfect is the enemy of the good in the kitchen, and if the thing that is stopping you from making your own pizza is the dough, then just buy it! There are plenty of good pre-made dough options at most supermarkets these days (check the prepared foods section). Or, if you have a local pizzeria that you like, you might ask if you can just buy the dough they use. Many pizzerias will happily sell you a few balls of dough for a few bucks. However you get the dough, the most important step to shaping it for this sheet pan pizza is to make sure it’s at room temperature. If it’s cold from the fridge, it’ll be tough to work with and will end up being too thick in parts. Assuming it is room temperature, though, just roll it out on a lightly floured surface and then press it into your sheet pan. Try to make it an even thickness in the bottom of the pan, but it’s okay to have some different crust thickness around the edges. That gives it character! Also, note that the best pan to use for this recipe is a quarter-sheet pan! Meat lovers’ pizza, to me, means it needs at least three things: Italian sausage, ham, and pepperoni. Could you add even more meat toppings? Probably, but be careful not to over top the pizza. Believe it or not, that is possible to do, and then you end up with a fork-and-knife pizza situation (not the end of the world). Ideally, though, you should be able to pick up a slice of this pizza and not have it collapse or the toppings jump ship. So, feel free to experiment with toppings here. I gave my favorite amounts of each for a nice balanced pizza. This sheet pan pizza makes, well, a sheet pan of pizza. It’s loaded and filling because the crust is a little thicker than your typical round pizza, so unless you are making this for a party, you’ll almost certainly have leftovers. But there is nothing wrong with having leftover pizza. This pizza is okay eaten cold, but I find it’s best if it’s reheated. To reheat pizza, place a slice or two in a large skillet (cast iron is best) over low heat. Cover the skillet and let it cook for a few minutes. The skillet will re-crisp the crust and the covered skillet will provide some steam to re-melt the cheese. Just like new! Looking For More Great Pizza Recipes? You can use any store-bought dough for this recipe, but if you would like to make your own, I highly recommend making no knead pizza dough. No matter what dough you use, be sure to let it come completely to room temperature before shaping it. It will be easier to work with; dough that is cold will often bounce back and not retain its shape when it’s rolled out. 2 Prep the sausage: The only thing you need to cook for the toppings is the sausage. Cook it in a medium skillet over medium heat until it’s cooked through, about eight minutes. Break up the sausage as it cooks. 3 Shape the pizza crust: Roll the dough out on a lightly floured surface into a rectangle roughly the size of your quarter-sheet pan. Then lift and transfer it to the pan, and press it into the sides of the pan firmly to form a lip of dough. Don’t be nervous about this step! Pizza dough is sturdy. Even if it tears a bit, just press it together in the pan and it’ll bake up fine! 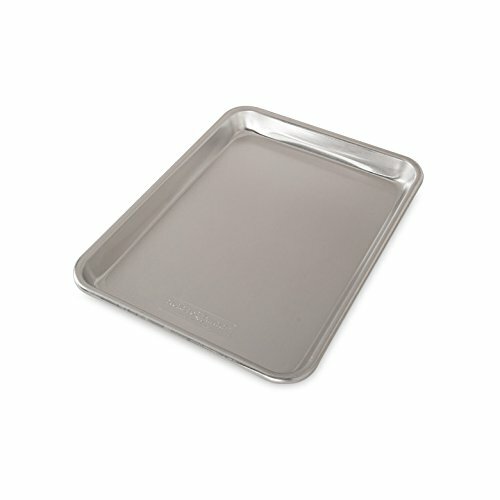 Try to make sure the dough is an even thickness on the bottom of the sheet pan, but it doesn’t have to be perfect. Having some inconsistencies makes homemade pizza great. 4 Top the pizza: Once the dough in the sheet pan, add the sauce in a thin layer. You can add more sauce if you like a saucier pizza, but I personally like a thin layer. Then add the cheese followed by all the toppings. Finish the pizza with big sprinkles of dried parsley and season with salt and pepper. 5 Bake the pizza for 20 to 25 minutes. It’s done when the crust around the edges is puffed and a deep tan color. The center should be bubbling hot and some of the cheese may have even browned a bit in spots. 6 Cool and serve: Let the pizza cool slightly before cutting and serving. Slice into square-ish shaped pieces. Leftovers will keep for about a week. It’s best to reheat them in a covered skillet over low heat for a few minutes. Hello! All photos and content are copyright protected. Please do not use our photos without prior written permission. If you wish to republish this recipe, please rewrite the recipe in your own unique words and link back to Meat Lovers’ Sheet Pan Pizza on Simply Recipes. Thank you!